What to Make With Flannel Fabrics? These fabrics have been in my stash for ages and ages. I seem to bring them out every year just around this time and try to sort out what to do with them. They’re mostly FQs, with a few half yards and one piece that’s a couple of yards. What would you make with these? Is it necessary to use a wider seam allowance than a quarter inch when working with flannels? I have perhaps another hour or so until the pieced border for Twinkling Stars is done. Then it’s a matter of pressing the borders and sewing them on. I’m definitely on track to get this done, perhaps even before the second game of the World Series. 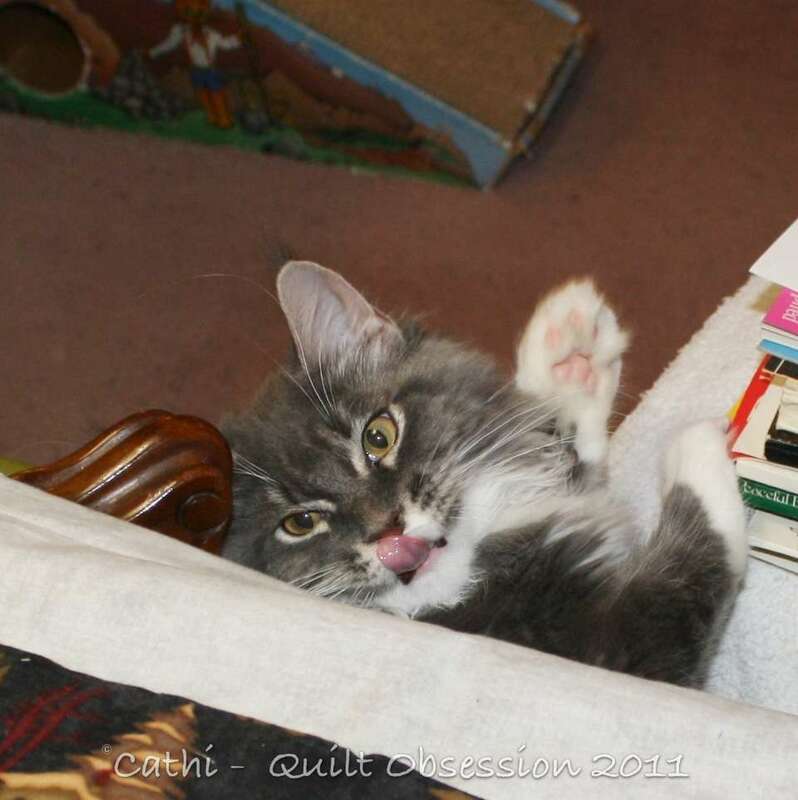 Baxter loves to lick/chew fabric so when we were setting up to take the pictures Tuesday night, he was eyeing the fabrics and doing this. Earlier in the day, he had been showing his more elegant self posing as kitty in lace. You don’t need wider seams. I love to use flannel as quilt backs. 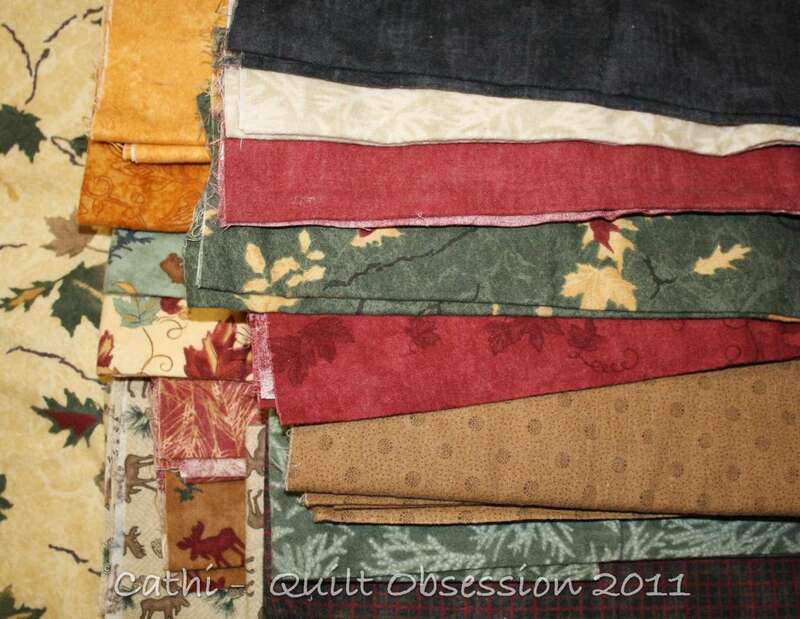 I have made several flannel quilts and 1/4 inch seams are what you need. No need for wider. They are great to work with and fun to have a soft cuddly quilt. The simpler the pattern the better only because the flannel seams can get bulky and if their are too many seams coming together at one point you may have some really big lumps. http://flic.kr/p/6MobB5 It was a little tricky working with those HSTs but liked the result. If I was to make another flannel quilt I’d be using a pattern that only had squares in it. Oops ps…. I’d go for the larger of the squares ie 3″ and you don’t need wider seams but I would make sure to pin. a flannel quilt is so cozy when its cold outside. You don’t need to use wider seams. haha, I see another name slipped into my comment… it’s just me! I don’t think you need to use wider seams and I love simple bolder block patterns for flannel quilts. I haven’t used flannels, so can’t comment…..but you could always make Baxter a warm quilt! I’m sure he would like it. 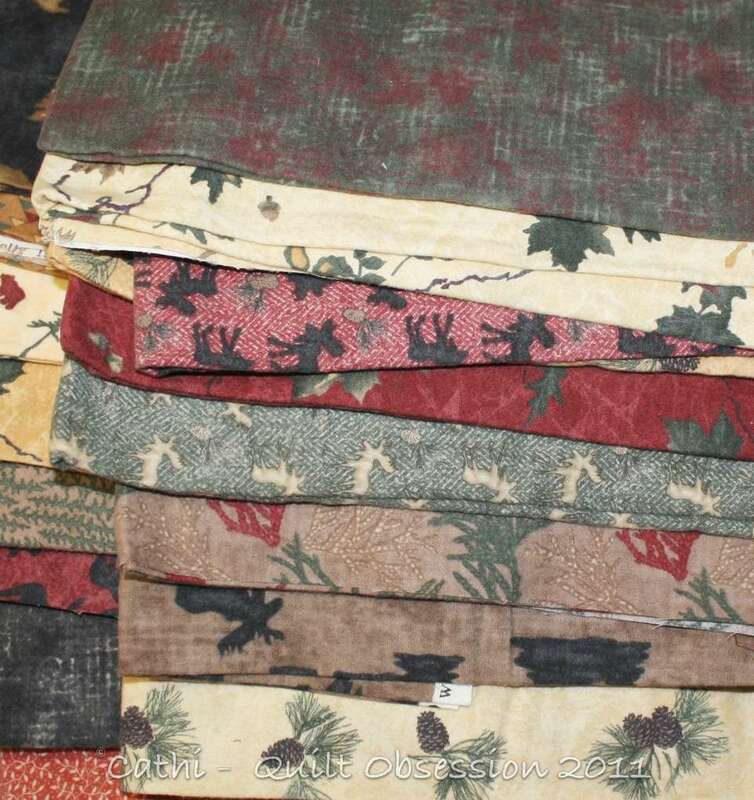 Oh, those are lovely “northwoods” feeling fabrics! I remember many from my stash…that disappeared with my move. I believe they’d be perfect for the “Yellow Brick Road” quilt…a super fast/easy lap quilt that everyone loves! 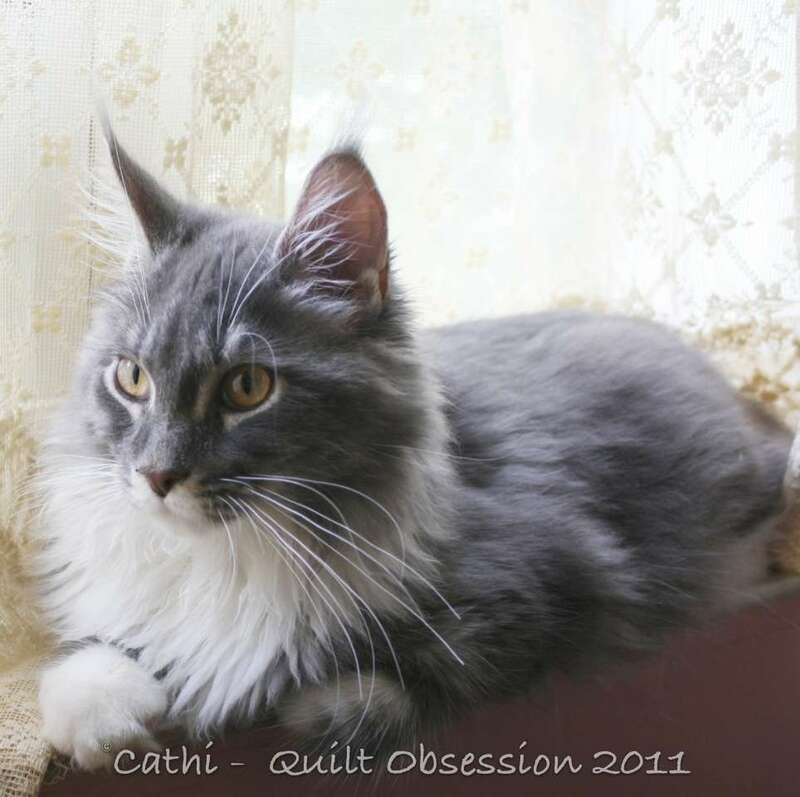 Oh that dear Baxter…you would just know that he’d develop a passion for fabric in your house! Flannel is so great! The same seam allowance will work but remember some of them are a bit stretchy at times. So soft and waiting for winter. If you think your cotton fabrics are cat magnets, just make a flannel quilt and watch the reaction that Baxter shows for it! I have a flannel log cabin quilt made about 10 years ago. The owner is rough on items and I had a chance to look at this quilt several weeks ago. It is pulling apart at the seams. I used 1/4″ seams. Now that said, there was an article in QNM, I believe, that recommended deepening the seams a bit when using flannel. So, if I were making another flannel quilt, I would consider the recipient and adjust the seam depth accordingly. quarter inch seams are fine, use a 2.0 stitch length if you want tighter seams. Here is a link go a quilt on my blog that is easy and I have used for 3 flannel quilts. Flannel tends to have more stretch to it so I found that starching it well before I cut anything out really helps. Hmmm… maybe as quilt backing for snuggle quilts? Great fabrics!…I look forward to seeing what you do with them. I have only used flannel as a backing fabric but making a flannel top is on my to-do list! Good luck! I would definately turn your lovely fabrics in a ragquilt. I has been on my want-to-make-list for ages. So easy to make, so very grateful to snuggle under on cold days.